Err... get on your horses and ride! In their day, cavalrymen armed with lances were some of the most formidable soldiers out on the battlefield. They were fast, deadly, and could turn the tide of an entire battle with one of their charges. And now you can add some to your Black Powder French forces. 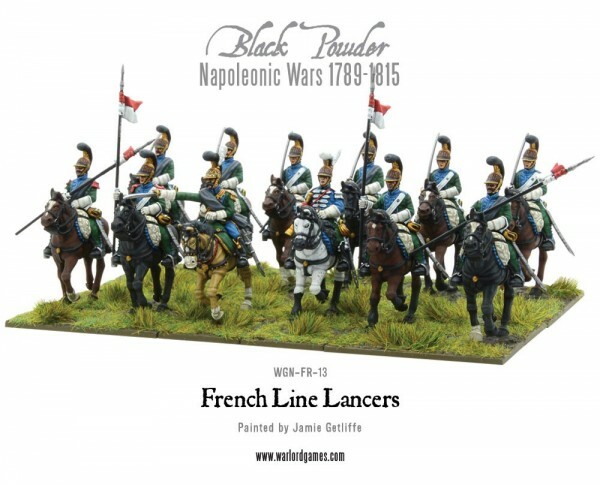 The box set comes with 12 plastic French Light Cavalry Lancer figures along with an extra metal officer figure as well as a metal horse for him. It also has an extra metal bulger and an optional arm to make one an eagle bearer. So you get a baker's dozen worth of figures in one kit.